The kids are back in school and out on the playing field. If your child is involved in a contact sport, you may be wondering if they need a mouthguard to protect their upper and lower teeth as well as their jaw and gums. According to the American Dental Association (ADA), kids of all ages, genders and levels of competitive play can benefit from mouthguards. In fact, 39 percent of all dental injuries are sports related, and many of these injuries could be avoided or diminished if a mouthguard is worn. According to the National Youth Sports Foundation for Safety (NYSFS), dental injuries are the most common type of orofacial injury sustained during sports participation. Additionally, an athlete is 60 times more likely to sustain damage to the teeth when not wearing a protective mouthguard. These dental injuries often result in permanent damage to oral structures which require medical intervention. Many of these dental injuries can be prevented by wearing a mouthguard. According to the American Academy of Pediatric Dentistry, sports accidents account for nearly 40 percent of all dental injuries in children. Facial injuries can happen during any athletic activity, so it’s a good idea to encourage children to wear mouthguards, even for non-contact sports. But, according to the ADA, a mouthguard is absolutely essential if your child participates in high contact sports as as basketball, hockey, football, lacrosse, soccer, wrestling, and even seemingly low-level contact sports like baseball and softball. There are two main options when it comes to buying a mouthguard. You can buy a pre-made version at a drug or sporting good store, or a dentist can make a custom made mouthguard for your child’s face and mouth. While both types offer protection, the custom-made mouthguard is far superior for a number of reasons. To get a custom mouthguard, your dentist will take imprints of your mouth and create your mouthguard using your exact specifications. This custom mouthguard will fit you perfectly, and it will be made from material that won’t wear down over short periods of time. Custom-made mouthguards are also generally thinner and sleeker, and usually barely noticeable. Because of this, custom-made mouthguards are far more comfortable than store-bought mouthguards. And if it is more comfortable, it is more likely to be worn regularly by your child. Wearing a store-bought mouthguard is certainly better than not wearing one at all. Mouthguards purchased at a store won’t fit as well and won’t last as long, but they will protect your child’s mouth better than if they didn’t wear a mouthguard. Noting this, it is safer and more affordable in the long run to purchase a custom mouthguard by your dentist. Simply put, if your child is actively engaged in sports, a custom mouthguard is the way to go. Are athletic mouthguards necessary for kids’ sports? Yes, absolutely. Mouthguards offer protection from injury and decrease the chance of lasting damage to your child’s mouth. 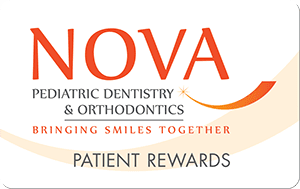 At NOVA Pediatric Dentistry & Orthodontics, our goal is to help make your child’s dental care as easy, comfortable, and enjoyable as possible. We can fit your child for a mouthguard using their exact specifications, so you rest assured that they are playing their desired sport with necessary, added safety. Call NOVA Pediatric Dentistry & Orthodontics today to have your child fitted for their very own custom mouthguard!